There is a class of sparse matrix computations, such as direct solvers of systems of linear equations, that change the fill-in (nonzero entries) of the coefficient matrix, and involve row and column operations (pivoting). 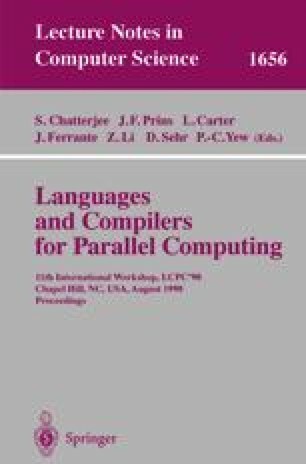 This paper addresses the problem of the parallelization of these sparse computations from the point of view of the parallel language and the compiler. Dynamic data structures for sparse matrix storage are analyzed, permitting to efficiently deal with fill-in and pivoting issues. Any of the data representations considered enforces the handling of indirections for data accesses, pointer referencing and dynamic data creation. All of these elements go beyond current data-parallel compilation technology. We propose a small set of new extensions to HPF-2 to parallelize these codes, supporting part of the new capabilities on a runtime library. This approach has been evaluated on a Cray T3E, implementing, in particular, the sparse LU factorization. This work was supported by the Ministry of Education and Science (CICYT) of Spain (TIC96-1125-C03), by the Xunta de Galicia (XUGA20605B96), by the European Union (BRITE-EURAM III BE95-1564), by the Human Capital and Mobility programme of the European Union (ERB4050P1921660), and by the Training and Research on Advanced Computing Systems (TRACS) at the Edinburgh Parallel Computing Centre (EPCC). T. Davis, University of Florida Sparse Matrix Collection. NA Digest, 92(42), 1994, 96(28), 1996, 97(23), 1997. See http://www.cise.ufl.edu/~davis/sparse/.